Hopefully, tomorrow we are releasing HOTKEYS, they are almost done, but will need a few additional checks so that all goes well once deployed. Moreover, we will also be releasing upgrade tiers in Army Setup for HQ DPC upgrades, that will enable us to ensure all sort of upgrades are worth it even in later stages! Go to WarZone, open Army setup and you’ll find a new category we just added: Unlocks! A completely new section that will add additional value to your accounts. Currently, we have five different Unlocks, four of them can be unlocked simply by progression in WarZone (Levels/Ranks) and the last one can unlocked via Gold – because it’s a kind of unlimited product, that allows the AutoClicker unlock to run on it’s own indefinitely without a cooldown period. 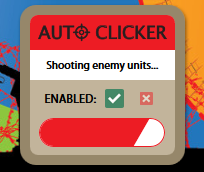 By unlocking AutoClicker to your arsenal, it will help you destroy units in WarZone with less effort and ensure your mouse stays intact and you don’t get a carpal tunnel syndrome!